The third in this critical environmental series, Anthropocene represents a significant departure from Manufactured Landscapes and Watermark. In a 2016 New Yorker profile of Edward Burtynsky, the "Canadian photographer known for his sweeping images of industrial projects and their effects on the environment," staff writer Raffi Khatchadourian makes a special point of noting that the much-celebrated artist's work has not gone completely uncriticized. At issue has been the question of whether or not Burtynsky's images -- which are usually shot with large format film and digital medium format cameras, and aerial assistance of one sort or another -- unduly aestheticize the environmental degradation they depict. For example, as Khatchadourian explains, "a critic responding to [Burtynsky's 2009 photobook] Oil wondered whether the fusing of beauty with monumentalism, of extreme photographic detachment with extreme ecological damage, could trigger only apathy as a response." He adds: "Where Burtynsky's epic industrial landscapes are least successful, they convey beauty and immensity without being intellectually engaging." How much one appreciates Anthropocene: The Human Epoch, the new documentary co-directed by Burtynsky, Jennifer Baichwal, and Nicholas de Pencier and the third installment in this series, will depend a lot on how one feels about such appraisals. Those affected by Burtynsky's "fusing of beauty with monumentalism" are likely to be moved by the film, warts and all. Those who share the criticisms of his work, however, will likely find the experience trying, and be far less forgiving of those warts. 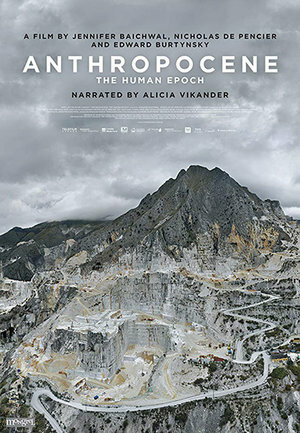 Anthropocene is the third collaboration between Burtynsky, Baichwal, and de Pencier, following 2006's Manufactured Landscapes (directed by Baichwal) and 2013's Watermark (co-directed by Baichwal and Burtynsky). Impressionistically shot on Super 16mm film by cinematographer/producer de Pencier, Manufactured Landscapes makes for an effective cinematic translation of Burtynsky's work, while also offering some impressive visual flourishes of its own -- most notably, the now-iconic tracking shot through a massive Chinese factory that sets the whole film into motion. On a purely technical level, Watermark appreciably raises the bar by shooting in 5K ultra-high-definition with prototype RED cameras. Otherwise, though, this look at Burtynsky's exploration of water is really just more of the same -- albeit without a sequence quite as fresh and spectacularly arresting as that Manufactured Landscapes opener. Though the three films are spoken of collectively as a trilogy, Anthropocene represents a significant departure from Manufactured Landscapes and Watermark. While the earlier films focus a substantial amount of attention on Burtynsky and his technique, complementing the images with context and glimpses into his artistic method, the new one excludes him entirely as a documentary "character". In so doing, Anthropocene not only breaks with its predecessors, but also loses one of their strengths: distance, or at least some semblance of it. Though neither Manufactured Landscapes nor Watermark meaningfully critiques Burtynsky's work, their ostensible position outside his process looking in does invite some thought about his whole photographic project. With Anthropocene, though, Baichwal and de Pencier's project becomes completely indistinguishable from Burtynsky's; their projects are now one and the same. Indeed, if Watermark closed most of the distance between the filmmakers and their subject by adding Burtynsky as a co-director, then Anthropocene closes it completely by taking him out of the frame altogether. This decision probably has a lot to do with the obvious crossover aspirations of the three filmmakers; not only does the subject's enormity call for a proportional creative treatment, its gravity demands that they magnetize an audience. Accordingly, the documentary is just one part of The Anthropocene Project -- an ambitious transmedia endeavor that also includes a book, interactive storytelling elements, and a travelling art installation (which opened simultaneously at the Art Gallery of Ontario in Toronto and the National Gallery of Canada in Ottawa this fall). "We have reached an unprecedented moment in planetary history. Humans now arguably change the Earth and its processes more than all other natural forces combined," Baichwal, de Pencier, and Burtynsky explain at the project's official website. "Combining art, film, virtual reality, augmented reality, and scientific research, [this] project investigates human influence on the state, dynamic and future of the Earth." With Burtynsky and his process omitted this time around, Anthropocene (the film) doubles-down on the transcendent imagery, shot once again in ultra-high-definition with cutting-edge tools. In addition, the documentary tries a somewhat new structure, organizing itself into seven vignettes: "Excavation", "Terraforming", "Technofossils", "Anthroturbation", "Boundary Limit", "Climate Change", and "Extinction". This sequencing allows the filmmakers to broaden out further than they did in the past, covering an even wider variety of vulnerable areas and industrial wastelands, as well as a few points of hope, around the world. Following the unwritten rules for documentaries made at a certain price point, there's also a celebrity narrator: Academy Award-winner Alicia Vikander (Ex Machina, Tomb Raider). But the elegiac voiceover is so completely unnecessary here that it's actually distracting; though the star power is meant to take things up a notch, it's a detriment to the film from the very first lines. In addition, without the interludes featuring Burtynsky at work, Anthropocene's imagery grows monotonous. (In particular, the aerial photography really wears thin by the end.) Also, because the film covers so much ground, it often leaves us wanting far more information about what we are shown. A sequence about marble quarrying in Carrara, Italy, for examole, is beautifully rendered, but doesn't communicate anything of substance about the environmental impacts of the practice. Worse still, other scenes, like one featuring a lithium mine in Chile's Atacama Desert, are precisely the kind of obtuse abstractions that Burtynsky's critics have found fault with in the past. The images of a dinghy floating on sickly green-colored water play with shape and color in ways that are aesthetically striking, sure... but what, if anything, are they actually contributing to our understanding? Burtynsky, Baichwal, and de Pencier seem to have made Anthropocene in order to move the needle on environmental stewardship. As Cinema Scope's Steve MacFarlane points out in his review of the film, it "ends on a note of complicity-for-all before announcing that the anthropocene is yet to be approved by the International Union of Geological Sciences as a classification for this epoch." 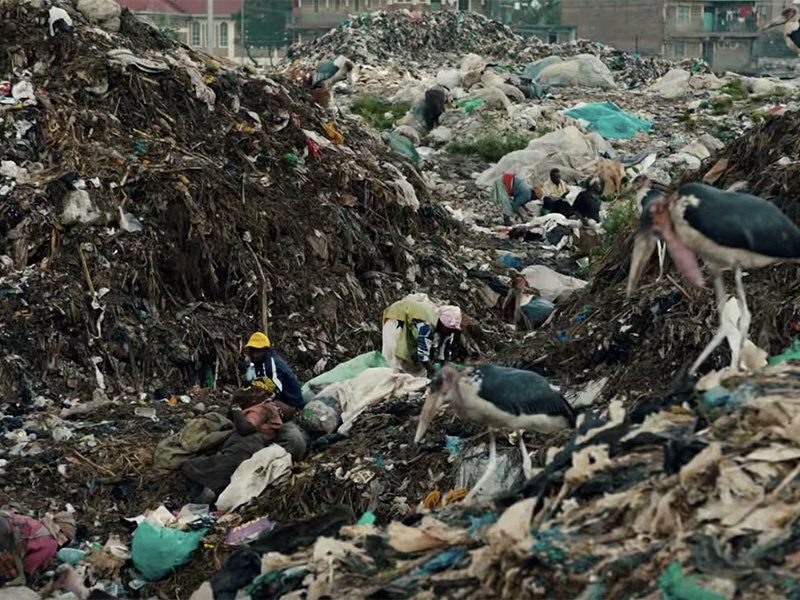 But the filmmakers don't explain why that is, nor is it clear that their images are what's needed to remove whatever doubts there may be; all the spoliation that we see in Anthropocene looks very bad, of course, but visuals alone don't make for a slam dunk case. Indeed, if Elizabeth Kolbert's 2014 Pulitzer Prize-winner The Sixth Extinction: An Unnatural History has been effective in demonstrating the reality of the anthropocene, it's because the author is so precise and thoroughgoing in her research. While Anthropocene is long on form, it's short on this kind of crucially important content. To be fair, some individual images and scenes do work in spite of this absence. 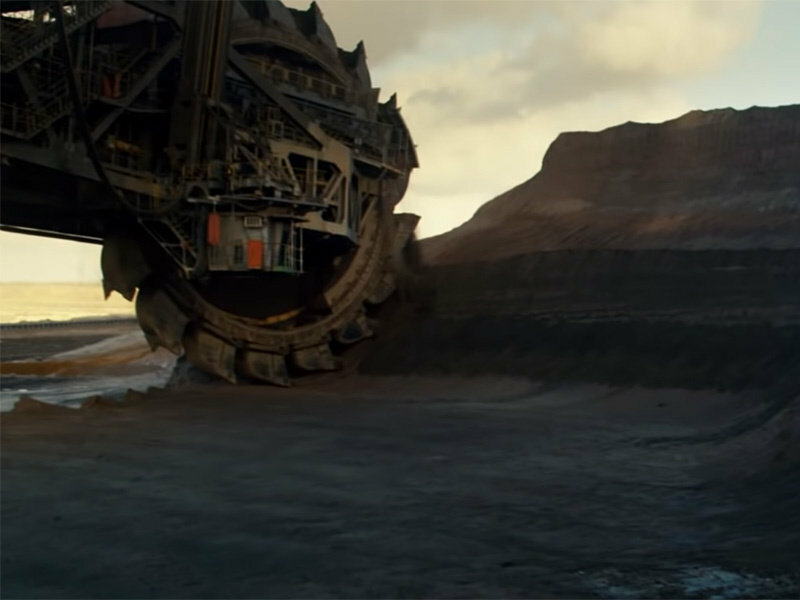 In particular, the way the filmmakers lens an enormous drill at a mining excavation in Immerath, Germany, suggests something out of a science fiction dystopia. Even for those well aware of the extent to which human ingenuity has been turned against the planet, it's a viscerally jolting sight. More images like this, paired with evidence-based argumentation, could be incredibly effective at galvanizing much-needed collective action. As it stands, though, Anthropocene mostly proves the points of Burtynsky's critics.